The manufacturer will plant one tree for every laptop registered since the beginning of 2017 as part of its new Make Earth Green Again campaign. In honor of Earth Day, Gigabyte/Aorus is launching a new campaign called Make Earth Green Again as an extension of the existing Plant-for-the-Planet campaign that aims to plant as many as 1 trillion tree seeds by 2020. The Taiwanese manufacturer has also joined forces with the United Nations Eivornment Programme (UNEP) in hopes of raising awareness of global warming and the rapidly decreasing forests around the world. When a user purchases a new Gigabyte laptop and registers the product online, the registrant can voluntarily opt in to Plant-for-the-Planet and receive a certificate for his or her contributions. Gigabyte as a company has always been eco-conscious. According to its press release, the manufacturer has reduced its carbon emissions by 40 percent compared to 2007 levels and its own headquarters building in Taiwan includes a sustainable eco-friendly rooftop. Other manufacturers have also been running eco-friendly programs to reduce waste and emissions including Lenovo and its use of recycled packaging materials or Dell and its campaign to pick up plastic wastes from oceans. If you have recently purchased or will soon own a Gigabyte laptop, then check out the source below to register the device and learn about the program. Taipei, Taiwan, April 21, 2017 - GIGABYTE technology is launching a [Make Earth Green Again] campaign this year. Global warming has always been a major concern for the world. UNEP initiated a project to plant one billion trees around the globe in 2006. The project was later handed over to Felix Finkbeiner and Plant-for-the-Planet, for whom and the foundation have set a grand goal of one trillion trees to be planted by the year of 2020. So far 14 billion trees have been planted by Plant-for-the-Planet from contributions from nations, companies, and individuals. GIGABYTE is proud to be part of this great campaign and is echoing to the cause with [Make Earth Green Again] campaign, in which owners of GIGABYTE laptops since 2017 may register their products and a tree will be planted by GIGABYTE through Plant-for-the-Planet in registrant’s name in the hopes to raise more awareness and contributions towards making one trillion. “Forests are disappearing rapidly. As this message being read, a forest the size of a football field is no longer in existence.” According to the World Wildlife Fund, forests the size of 48 football field are lost every minute. Forests are disappearing at an alarming rate, and issues of global warming and climate change are not about what happened, but what is happening now. 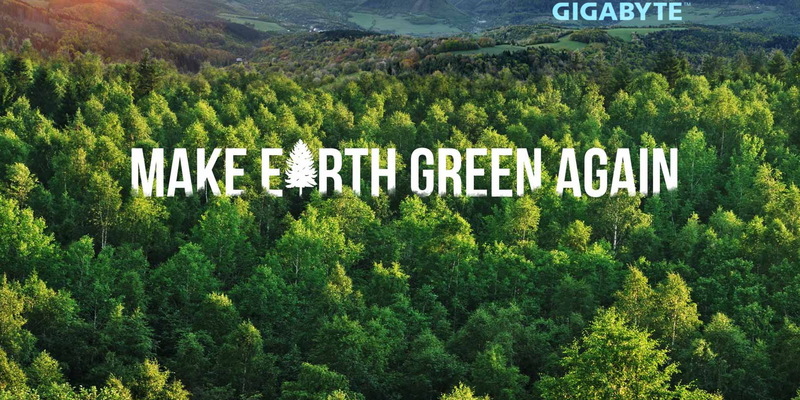 GIGABYTE understands that many people shy away from great causes because they seem out of reach, therefore has initiated the [Make Earth Green Again] campaign. In which for every laptop bought and registered since 2017, the registrant can opt to be accredited for a tree planted by GIGABYTE through Plant-for-the-Planet, and receive a certificate as recognition of being part of the cause. With the campaign, GIGABYTE looks to show how even the small and trivial actions can also be part of something great. Since 2009, GIGABYTE launched the "Green Action Plan" in order to improve energy and resource efficiency and aim to reach zero waste and pollution. By developing low-carbon technologies and designing green products, eliminating harmful toxins in production processes, enhancing a sustainable supply chain, and, on top of its headquarter in Taiwan, building a sustainable eco rooftop, GIGABYTE has successfully reduced its carbon emission by 40% in comparison to 2007. GIGABYTE also promotes eco sustainability through educational workshops and volunteer programs, encouraging its employees to pay attention to the environmental and ecological developments. Dedicated to the core value of [Upgrade Your Life], GIGABYTE hopes [Make Earth Green Again] campaign can bring awareness to eco justice - that no effort is too insignificant or strength too weak, as long as there is action taken, trees will be planted, and together we will be able to reforest Earth, one laptop at a time.